I have a puppy. 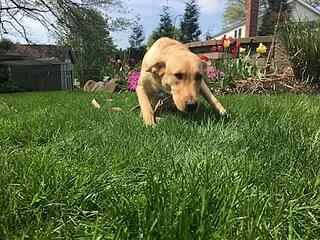 Well, I have an 8-month-old, 65 pound yellow Labrador Retriever (her name is Abby). In fact, I’ve always had dogs. Man’s best friend indeed! I think dogs and the outdoors go together. Given that my profession is landscaping, Abby and I spend quite some time in my backyard. Of course. Everything is dangerous if too much is consumed. Think of French fries…too much of a good thing and now heart disease comes into play. (For the record, pesticides refers to a grouping of chemicals that kills pests. This includes weed killer, insect sprays, and rodenticides). Abby gets her dose of pesticides regularly. We give her Nexgard to keep fleas, ticks, and heartworms away. The key to this is Minimum Effective Dose (MED). This means what is the least amount of chemicals that can be applied that still achieves the desired results. This is measured by LD50. This means that the Lethal Dose occurred in 50% of test subjects and is usually expressed in milligrams per kilogram. This information is always included on the SDS (Safety Data Sheet) that manufacturers are required to provide. Back to lawn care…my grass measures about 10,000 square feet. In order to treat weeds, I read the label of the product (The label is the law!). I determine that I need two ounces of concentrated product, mixed into one gallon of water to treat 1,000 square feet. This means that I need twenty total ounces of concentrated product to treat my whole lawn. (Being practical, I would never treat the whole lawn with herbicides, but more on that later). Mathematically, Abby would need to consume about six ounces of product for her to have serious effects. The key here is realizing that once sprayed, she’d have to eat about 6,000 square feet of grass to get that dose. No dog could eat that much, not even a Labrador! The vomiting of grass would occur way sooner than that. (Gross, I know). The label is the law! We follow the guidelines provided by the manufacturer. Our applications are licensed by the State of Ohio and we use personal protective equipment as required. We post flags indicating pesticide applications. If requested, we also post 24-hour notices of pesticide applications so that the general public is aware of the upcoming schedule. We spot treat weeds (vs. blanket spraying) whenever we can. Should I be concerned about fertilizers? Again, yes. But, the way that I view it with Abby is simple. I wait 24 hours before I take her on the lawn. A good watering helps as well. I also have an area (the tree lawn) that is designated as a no-application area so she has a spot to do her business. Some homeowner associations also designate a “no application” area for this purpose. So, what would I do if this wasn’t an option? I would just wipe off her paws after being outside. I think of it like this—what if Abby and I hiked a muddy trail and paws/shoes were covered in muck? We’d clean our feet before going back inside, of course. Same thing! Prepare by filling a small bucket with water and a rag and when done, just gently wipe the paws with water. Turf fertilizers are generally ground up rock (limestones), phosphates, and chemical compounds that provide nitrogen, phosphorous and potassium to the soil. Most pets have thick pads that aren’t going to absorb the chemicals very easily. The only concern would be fertilizer “prills” getting caught in the webbing of the foot. However a quick washing of the paws would take care of this. Disclaimer- Abby’s feet smell like Fritos, so the foot washing has a secondary benefit. Again, the label is the law! We follow the application rates as prescribed. Our applicators are trained to protect humans and pets and can make accommodations if needed. Fertilizers are cleaned off of hard surfaces (driveways and sidewalks) following applications. Although not required by Ohio, we do post application signs following fertilizer treatments (Ohio only requires signage about pesticides, but we want to go above the minimum). As I think about all this pesticide stuff, I am reminded of the common everyday exposure that we humans put ourselves through. We eat Round-Up ready crops. (This means we eat corn that has been modified to allow Round-Up to be sprayed on it so undesirable crops don’t grow around it). We spray Deep Woods Off on our skin when hiking. (The insecticide DEET keeps ticks and mosquitos away). We have companies spray for ants along our baseboards in the spring. So, while exposure is a danger to humans and animals alike- there are sensible ways to keep your dog safe (This stuff also works for cats!). Just be aware of conditions and take the steps to protect your furry buddy. Well, as I finish this, Abby is sitting in front of me. She’s patiently waiting, ball in mouth, and wants to play! Gotta go!